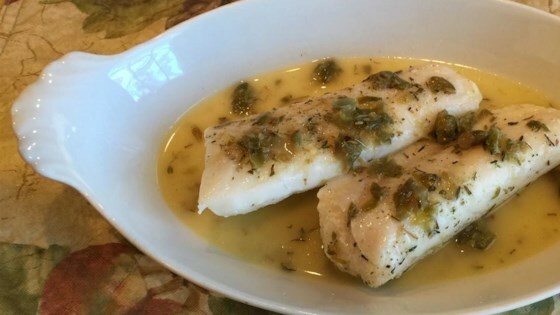 "This simple lemon caper butter sauce is the perfect accompaniment to sauteed sole." Crush capers in a small bowl with the back of a spoon. Melt 1/2 teaspoon butter in a skillet over medium-high heat until the butter foams and is golden; saute capers until fragrant, about 15 seconds. Add lemon juice, bring to a simmer, and cook, stirring frequently, until liquid is reduced by one-third, 1 to 3 minutes. Season with salt and pepper. Remove from heat. Stir cold butter and savory into lemon mixture, stirring constantly until butter is completely melted and sauce is shiny and thick, about 1 minute. Very lemony, so next time I will be cutting lemon juice at least in half and compensating with butter. But the flavor of the sauteed carpers in the butter sauce was amazing! Wow, way too lemony. I don't mind lots of butter but it was too tangy for my taste but my bf liked it. I think next time I will mix some sour cream in it for a milder flavor. I made it with 1 large lemon since the mahi mahi was marinated in lime juice and it came out great! I didn’t have savory however I added dill. I will be making this for everything from now on! Prepared this sauce for chicken. Based on others' comments, I used the juice of only 1 lemon, not 2, and added a tablespoon or so of sour cream. It was delicious and received strong compliments! This was amazing!! Are used one large Meyer lemon, And it was perfect! Loved by all on fresh fish!